Since 1987, we’ve specialized in branding, advertising, and web design becoming one of the most prominent public relations firms in our area. We tailor our recommendations to our clients’ needs, knowing that every business faces unique challenges and targets specific customers. No project is too large or too small for. Our consistent performance has caught the eyes of Clutch, a B2B ratings and reviews firm based in the heart of Washington DC. 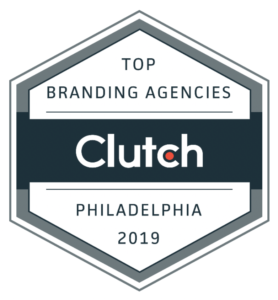 They’ve recently featured us in their 2019 report on the top agencies in Philadelphia. The full list of leaders was published on 27 March. Clutch is dedicated to connecting businesses of all sizes to business solutions and services providers that will help them overcome their next business hurdle. They evaluate thousands of businesses across a variety of sectors based on their technical capabilities, market presence, and unbiased client reviews. Based on this evaluation, we’ve been named among the top 15 branding agencies in Philadelphia! A Leaders Matrix provides a broad overview of the top performing companies in a particular industry or location. We’re proud to be in such good company on this vetted list. These reviews have also led to our presence Clutch’s sister sites: The Manifest and Visual Objects. The Manifest is a business news and how-to site that provides industry reports and other metrics that helps businesses narrow their search for their next provider. We are listed among the best web designers in Philadelphia, along with a recent project and list of our notable clientele. But reviews are not the only significant criteria in the buyer’s purchasing journey, which is where Visual Objects comes in. Visual Objects is a portfolio website for creative, design, and development agencies to display their work, helping businesses visualize a future project before hiring their next business partner. The top brand consultants are listed alongside some of their most impressive logo designs and other marketing collateral. All that said, we’re ecstatic to kick off 2019 with an accolade based in client feedback. Our clients have been nothing but supportive, and we look forward to evolving our skills and knowledge with their continued loyalty as well as through new partnerships.